In order to understand more about how we smell we performed several innovative studies to demonstrate how smell could be measured. The first such study is noted below. Purpose: Because smell function is difficult to measure we developed a novel technique by which smell function can be obtained in an objective manner. The technique we developed uses functional magnetic resonance imaging (fMRI) of the brain in response to specific odors in order to obtain quantitative measurements of activation in different parts of the brain and to obtain brain maps of the location of regions in the brain that are activated during olfactory stimulation. Methods: In this study, fMRI brain scans were obtained in 17 normal subjects (9 men, 8 women) using multislice FLASH MRI in response to three olfactory stimuli (pyridine, menthone, amyl acetate) in three coronal brain sections extending from anterior to posterior temporal brain regions. Activation images were derived using correlation analysis and ratios of areas of brain area activated to total brain areas were calculated. Results: Activation was present in each section in all subjects. Subjective estimation of vapor intensity followed the order pyridine > amyl acetate > menthone, was similar for both men and women and followed relative vapor pressure of stimuli. Brain activation did not follow the order of subjective responsiveness but rather the order pyridine > menthone > amyl acetate, a pattern demonstrated by both men and women. Brain activation in women was consistently lower than in men for all vapors in all sections studied although regions of activation did not differ. Brain regions activated were, in general, previously recognized as associated with olfactory function; however, extensive regions in frontal cortex were also activated suggesting that they may play a more important role in processing olfactory information in humans than previously considered. There was no difference in brain regions activated for odors considered pleasant or unpleasant. Conclusion: The techniques used in this study demonstrated that brain activation to olfactory stimuli could be measured quantitatively such that differences between groups of subjects (in this case men and women) could be compared. Although localization of brain activation was not the major thrust of this study, activation of olfactory stimuli was found not only in brain regions previously associated with processing of olfactory information but also in several other areas of frontal cortex, in cingulate gyrus, and in several components of the limbic system. This is the first study in which activation in human brain parenchyma of normal humans to olfactory stimuli has been quantitated by fMRI. 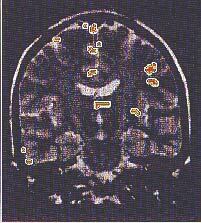 Brain activation pattern in the 26 year old male subject in whom the signal changes were obtained. Activation is visible in the frontal lobe and in the cingulate gyral region. The yellow-red colors of activated areas reflect a continuum of activation over a correlation coefficient range from 0.7 (yellow) to 1.0 (red). Three brain activation images showing anterior, middle, and posterior section in response to amyl acetate in a 22-year-old man using multislice FLASH acquisition. Response patterns observed here are representative of those obtained in both men and women albeit quantitatively less in women. Anterior section (top) shows activation in the frontal cortex, left inferior frontal cortex, and left temporal tip. Middle section (center) shows activity in frontal cortex and cingulate gyral region. Posterior section (bottom) show activity in both temporal lobes, frontal cortex, and cingulum. Colors of activated areas are representative of correlation coefficients. In the photograph above shown there are three brain activation images (A-C) showing anterior, middle, and posterior sections in response to amyl acetate in a 22 year old man using multislice FLASH acquisition. Response patterns observed here are representative of those obtained in both men and women albeit quantitatively less in women. Anterior section (A) shows activation in the frontal cortex, left inferior frontal cortex, and left temporal tip. Middle section (B) shows activity in frontal cortex and cingulate gyral region. Posterior section (C) shows activity in both temporal lobes, frontal cortex, and cingulum. The yellow-red colors of activated areas reflect a continuum of activation over a correlation coefficient range from 0.7 (yellow) to 1.0 (red). The complete reference for this study is: Levy, L. M., Henkin, R. I., Hutter, A, Lin, C. S., Martins, D, Schellinger, D. Functional MRI of human olfaction. J. Comp. Asst. Tomog. 21:849-856, 1997. See a study relating to people with smell dysfunctions.